Ljubljana is a fun little town so finding ways to amuse yourself is never too difficult. You may however feel a bit lost when you’re visiting the town for the first time. If you are, here are some fun things you can do while you’re here. There is a number of great clubs in Ljubljana. So what better way to have fun than to go clubbing? The town has a booming mainstream scene as well as several alternative party places offering something for everyone. If you’re more into the former than a great way to get the party started is joining a Pub Crawl. You’ll get tons of shots, play drinking games and meet other travelers. All the while you’ll be visiting some of the best bars in town. When you’re unfamiliar with the local scene there’s always a risk of ending up in a dull place. And going on a Pub Crawl eliminates that risk. The crawl usually ends in a popular club so you’ll have that covered as well. Something a bit classier than the first option but no less fun. And you can always go clubbing afterwards. Wine tasting takes place in a charming 300 year old cellar in town center. It’s a special degustation program hosted by a wine expert, who guides you through tasting 7 of the finest local wines. It’s also informative, teaching you about the culture of proper wine drinking, food pairings and pretty much everything else there is to know about wine. It hosts smaller groups of up to 15 people and is perfect for meeting like minded travelers in a more secluded, toned down atmosphere. That’s us! 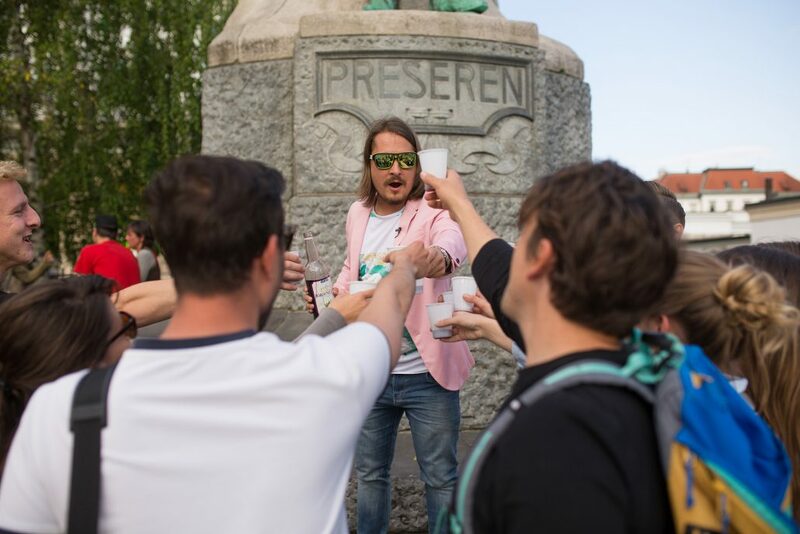 If you’re tired of the dry and factual sightseeing you usually get on regular tours and would rather hear some funny stories behind Ljubljana’s main attractions than this tour couldn’t be more perfect for you. The guide is actually a skilled comedian cracking jokes as you make your way through town. This makes sightseeing a hell of a lot more fun and you’ll be surprised to hear how many hilarious stories there is to know about the otherwise serious landmarks and monuments in Ljubljana. That’s 3 fun things you can do while you’re in town. There are of course many more, such as trying the local cuisine, boat rides, lounge bars and all sorts of sports. If you’re in luck there may also be a festival taking place at the time of your visit. In the end what you find to be most fun is up to you. Not two people are completely alike but hopefully you’re able to find yourself in some of the many choices you have in Ljubljana.